I used to write off Marvel’s Ultimate universe as a cheap imitation of the real Earth-616 Marvel continuity that began with Fantastic Four #1 in 1961. Now? It’s possibly my preferred recommendation for new Marvel comic readers. The Ultimate Marvel Universe is thrilling, a fantastic entry-point, and rarely wastes time on slow plodding storylines. 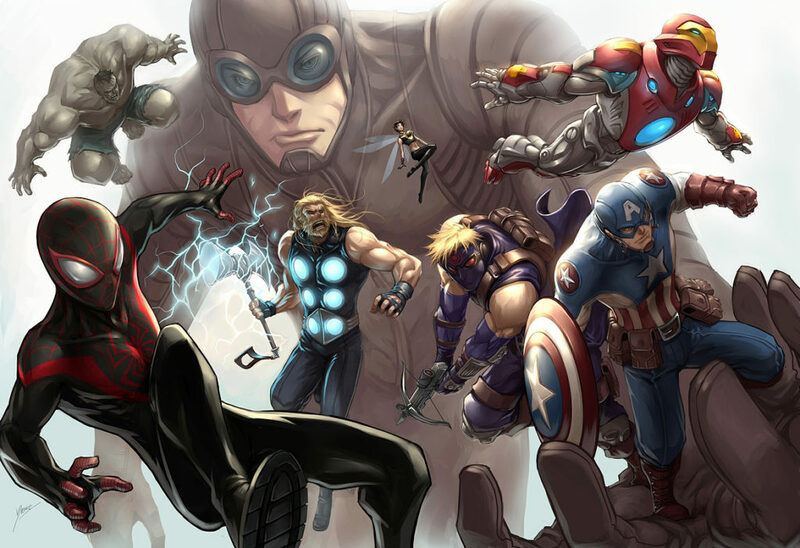 For the uninitiated, Marvel’s Ultimate line of comics takes all the existing and known characters – Spider-Man, the X-Men, the Avengers – and recasts them in a similar, yet different Ultimate Universe set in the 2000s. It’s the sort of concept that could have fallen flat on its head, but actually works for some of the best Marvel stories of the decade. Below you’ll find a reading order for the Ultimate Universe. Although I split up all the issues, I would mention that you can actually read a lot of these series without too much concern for the others. For example, I read over 100 issues of Ultimate Spider-Man before I ever even thought about the outside Ultimate Universe, and the reading experience was highly enjoyable. So roll with the approach that feels right to you. The Ultimate Universe is an enjoyable and completely palatable read in its entirety. Nonetheless, if you still want all killer no filler – and if Sum 41 taught us anything, it’s that you most certainly do – here are my picks for the best 10 Ultimate Universe comics of all time! Please note that the issue by issue reading order can be found below, and that the rest of these collections can be found in the Ultimate Universe trade collector’s guide. This story is all flashback so you could choose to read it after Daredevil makes an appearance in Ultimate Marvel Team-Up, but I prefer it as origin here. Another flashback that is actually published well after a number of the issues below. Daredevil and Elektra are not hugely essential to many of the following Spider-Man, X-Men, and Ultimates stories (although they do pop up) so you could always come back to these stories if you like. Flashback Iron Man origins from series released in 2005 and 2007-2008 respectively. I consider these pretty inessential and prefer Mark Millar and Bryan Hitch’s fully formed Tony Stark in The Ultimates. That said, Iron Man’s origins in the Ultimate universe are very different than those of Earth-616 (the main Marvel Universe), so it’s some semi-interesting background. Worth noting as well that several in the comments have declared these issues out of continuity, and I’m hard pressed to argue otherwise. Ultimate Fantastic Four didn’t actually launch until 2003 – well after The Ultimates. The team is referenced off-handedly in Ultimates #2, but I prefer their origin here. Alright, after some notes in the comments let’s go ahead and call this one: Out of continuity! It’s a weird Fantastic Four story that never really aligns with the Ultimate Fantastic Four that would come. Technically the Ultimate Vision saga was collected in short stories across the Ultimate line of comics. So, for example, Ultimate Spider-Man #86 included a piece of the Vision story. In Marvel Unlimited, though, you can just read Ultimate Vision #0 altogether, and frankly it’s a lot more cohesive. Most of this showdown is published well after Ultimates v2 but I think it makes more sense before the conclusion of the Ultimates second wave. 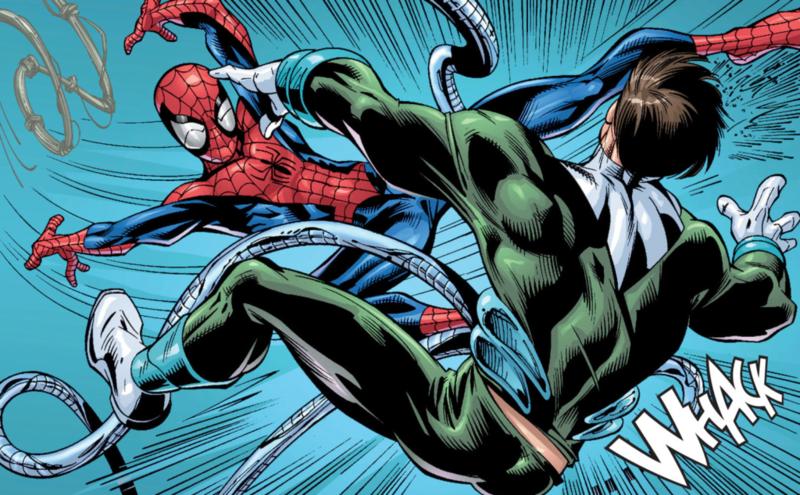 The Ultimate Spider-Man numbering returns to the original counting for the 150th issue. The Ultimate Universe Concludes in Secret Wars! Check out the future of the Ultimates in Ultimates Vol. 1: Omniversal ! If you like Comic Book Herald, and are able to donate, any small contribution will help keep CBH alive and full of new comics guides and content. Donate here! Or learn more about easy ways to support Comic Book Hearld! Thank you for reading! ultimate marvel team up was a dissapoinment. I recommend not reading it. My only question is does it affect the storyline if you dont read Marvel Team Up? No, not really. They’re referenced in passing, but nothing you can’t get from context. I do agree though, they are poor! Just started using this reading guide and was wondering if when I get to Secret Wars will I be able to start reading Earth 616 from the aftermath of Secret Wars or not. By the way I love this website so much it has helped me appreciate comics again. Also interested in an answer to this. I’ve started going through, this is mainly about curiosity about the Maker and the Fantastic Four, but why are the Marvel Teamups placed before Ultimate X-Men? The Team-ups came out after. Forgive me if I’m wrong, but weren’t Marvel comics (under a different name) first published in 1936? Is there a list/reading order starting from there? The Ultimate universe started in 2000. Hi. I’m a newbie to comics because I never had access to them when I was younger but digital comics have really helped. So since I’m just starting out, is this list all the issues or just your special picks? If these are just your special picks is there a way to know all the issues. Also, do you advice reading just comics of certain characters like for example I want to read Black Panther comics (and those of others characters too) or do you think I read comics by order of year of publication and read the whole lot instead of focusing on one character? This is a super helpful guide, because I own hardbacks of at least half of the Ultimate universe but fell off right before Miles Morales was introduced. Now I want to catch up! There’s something missing though… Both Ultimate Power and a few one-off stories use characters from Supreme Power, which is sort of an ULTIMATE version of the Supremeverse. Therefore, I believe that JMS’s run on Supreme Power is worth reading even before you get into the mainstream stuff. It’s certainly more relevant than One Tin Soldier, Ultimate Iron Man or Ultimate Daredevil and Elektra! Ultimate Daredevil & Elektra, Vol. 1 is basically flashbacks from their time at the college. So it is ok if you decide to read it later, it is not going to affect the chronology at all. where does ultimate end fit in? and where does it go from there? does the ultimate comic world end? Also a big fan of the Ultimate Universe but I only ever read Spidey/X-Men and the first couple trades of UFF. Your guide is excellent! I have a few notes from my read through though, I’m currently starting Ultimate Power. Ultimate X-Men #66 – #74: After the Date Night storyline Kitty mentions to Wolverine that Spider-Man saved them from the Marauders. It took me a lot of searching to find out they were referring to Deadpool’s team in the story arc in Ultimate Spider-Man #91 – #96 which is way ahead of your reading order. I think Ultimate Wolverine vs Hulk also does better after the full run of Ultimates 2, as Betty Ross is not jailed or participating in any fights as She-Hulk. It would also explain better why *spoiler* Fury lets Banner go at the end of the story. I haven’t finished Ultimate Power #1 – #9 yet but it starts out with Kitty and Peter still dating and from what I can tell the FF don’t seem to know Peter is Spidey. having it come before Ultimate Spider-Man #97 – #105 would explain why Peter felt he could just show up and ask the FF for help as well, as he seems to be about to help them with some sort of Dimension crossing adventure. ….Okay I just finished the last issue. Your time line for Ultimate Power does work better considering how it ends… Although this is the most plot-holey storyline I’ve read in the Ultimateverse. Peter is confused as to where Fury is after all this, even though he was there. Not to mention the plot hole with Kitty/Peter and how the F Doom returned from the Z-universe. Okay imma stop replying now. I’m not sure if you’re still following this and commenting back…but thought I’d give it a try. I’ve been following this list for about a year and a half and have now managed to get myself every TPB up to “cataclysm” – so very close to finally finishing the whole universe! I was wondering whether there are any Ultimate tpb that you’ve missed off this list intentionally or whether anyone knows of any that have been missed? I would generally recommend reading the Supreme Power comic books to supplement your understanding of Ultimate Power. You’ll have a better understanding of Squadron Supreme and also Nick Fury and Power Princess switch places for a while. It isn’t really necessary to read, but the Age of Ultron event in the mainstream (kind of) Marvel universe is responsible for Galactus entering the Ultimate universe and kicking off Cataclysm. Miles Morales also crosses over into the mainstream Marvel universe in the pages of All-New X-Men #31-36. Also Miles Morales and Jessica Drew both have parts in the Spider-Verse crossover event, which is a great read even without Miles and Jessica. That aside, all of the regular Ultimate universe stuff seems to be accounted for, although there are issues with this order. Fantastic! Thank you for the information! I’ll certainly dip into Supreme Power, and I’ve polished off the Spider-Verse once or twice already! Again, thank you for the info! Good to know I’ve nearly cracked the lot! Thank you so much for this guides, it’s been really helpful! I’m halfaw through reading the Ultimate Universe and I feel like 2012 Marvel Now would be a good entry point to the classic universe. My question is: do you think I should finish the whole Ultimate comics first, then Marvel Now, then Secret War? Or does it make more sense to read them both at the same time? And if so, after what Ultimate event is it wise to start Marvel Now? Sorry for my English, I’m a French reader. Thanks again for your amazing work! 1. Nightcrawler in x men comics has had a telling off and is no longer an x man, however, cut to a spider man comic, and there he is fighting alongside them. 2. Magneto is in hiding, yet cut to the spider man comics, and suddenly hes fighting the x men, and all the x men are together having disbanded in a previous x men comic! 3. Peter parker has an assignment where he has to look after these pretend babies. then the assignment finishes, yet in the following annual, guess what! There are the babies again! 4. Wolverine vs hulk. great. but afterwards…hang on, why is he suddenly back with the x men? And then after a few issues he goes to meet Nick Fury. To talk about what? To talk about fighting the hulk of course. I let a few slide, but it’s getting silly now! No offence, but i feel like ive wasted a lot of time going through this when I could be looking at a more accurate one. ( in some comics it even says “this takes place after issue blah blah blah” and you can’t even get that right!) Nice try, but no cigar, bub. In the time it took you to write that up, you could have easily fucked off and found somewhere else to moan. Don’t appreciate the work put into this, don’t look at this. Your list has truly been a great help, and I thank you for putting it together. However, I noticed that you have it listed that you should read Ultimate X-men #72-#74 before you read Ultimate Spider-man #91-#94. After reading those issues, I’ve found it would probably make more sense to read Spider-man #91-#94 BEFORE Ultimate X-men #72-#74, as Ultimate X-men #72 references the events that occurred in Ultimate Spider-man #91-#94 (which heavily features the X-men). Other than that, it is a very good reading order, and I’ve really enjoyed reading the Ultimate Universe using it. Hi. I’m around that part and decided to pay close attention to what you said about the events on USM #91-94 being referenced on UXM #72. What I found is that one of the X-men says, and I quote: “(…) He totally saved our butts from the MARAUDERS while you were gone. (…)” However, the events on the aforementioned USM issues are with the Reavers… I don’t know, it could be a typo on the UXM issue or something that happened off-scene. Anyway, your comments on the matter are truly appreciated and they make me read more thoroughly. I’d say jump on with the My Marvelous Year reading club. February is starting and we are getting in 2001, which starts leading us into Disassembled and the long line of Avengers Events. I’m curious about why ultimate origins is listed so far down when it’s basically an origins story that starts towards the begging? Or am I missing something? I like it at the beggining of my bookshelf personally but that’s just me. Thanks to this guide I have read every single 1610 comic. Plenty of high points (USM being a personal fav from issue 1 all the way through), and few lows (The last few arcs of UXM were less than stellar) made reading it a pleasure. I really enjoyed Ultimatum myself and was glad to see that the changes that happened stayed happened, something that the 616 could learn from I think. If a character dies, don’t bring them back 1000 times. I’ve yet to read Secret Wars to see how everything finishes, but now I’ve joined the reading club I think I’ll be taking a break from finding out for a while. I see The Squadron Supreme coming up and I was doing skimming some info about them. Another list has Supreme Power v1 1-6 in the list, after UXM # 39 and 7-18 later on, along with Doctor Spectrum. I suppose they explain the origins of Squadron Surpreme (?) but these were run under MAX a marvel imprint and I wasn’t able to find them on Unlimited. I did, however, come across Squadron Supreme Saga, which seems like it might be summary of that run. Can you confirm? Is there a reason you chose to leave these off? Oh, and yes, the Ultimate Annual #1 happens after Ultimates 2 #4. I’m an old brazilian reader of Marvel’s comics (my history traces back to 1998) who happened to get very apart of it and recently have been caught back to this reading, and all I have to tell you is that this whole work of yours is just jaw dropping, and I can’t congratulate enough for it. Thanks for this! I just subscribed recently to your Marvelous Year reading club so I’ve been frantically catching up with that (So close now! Just got to 1985, so I’ll be caught up with you guys soon) but have been wanting to check out the Ultimate Universe. I remember reading through the Ultimate Spider-Man comics when I was younger but don’t remember them as well, and have barely read any of the Ultimate X-Men or Fantastic Four comics. Your lists are so great though! I followed through your Modern Marvel guide up until civil war before subscribing to the reading club, and I have to say they work perfectly so that you don’t miss out on any details in the comic timelines. Stay awesome.